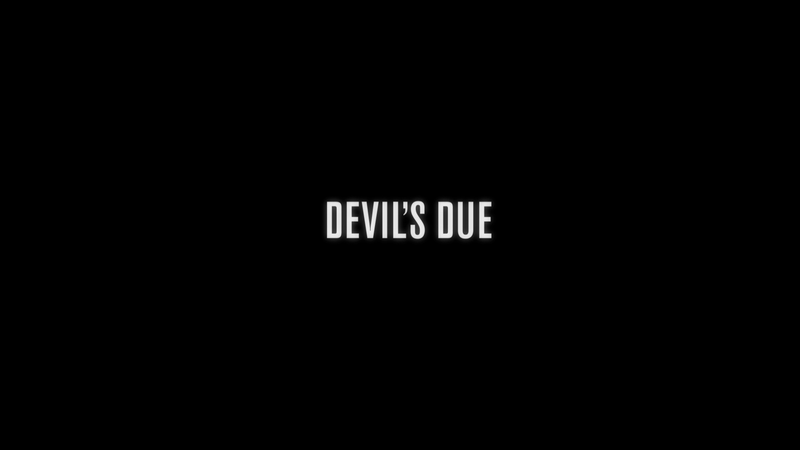 Devil’s Due might not be the worst found footage movie I’ve encountered in the last few years but it sure as hell (no pun intended) is the dullest with the first 50-minutes of either boredom as we watch somebody else’s home movie or laugh out loud at some unintentional funny moments, but the final sequence isn’t bad and is actually fairly impressive, yet it can’t quite make up for the rest of the film. I’ll admit up front: I don’t like found footage movies, especially the recent flock of releases in the past few years. Between Chernobyl Diaries, the slew of Paranormal Activity sequels and The Devil Inside (the worst of the bunch), amongst numerous others, I’ve had to my neck with these and especially those that can’t even tell a good story. 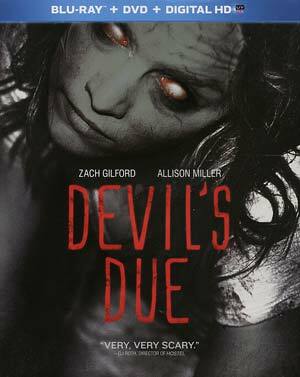 The latest is Devil’s Due, a dull picture through the first 45-50 minutes and somewhat recovers until the end. The plot centers on married couple Zach (ZACH GILFORD) and Samantha (ALLISON MILLER) who, while on their honeymoon in the Dominican Republic, get lost on the seedy streets and are picked up by a cabby who takes them to an exclusive underground (literally) club and are soon drugged and taken to a ritualistic ceremony where some crazy sh** happens where Samantha lays in the center of a Satanic circle, some bright light forms and they wake up the next morning back in their hotel room set to return home in a couple of hours. They come back home, unwrap their wedding gifts when later Sam reveals a gift of her own: she’s pregnant, this despite her being on the pill. They’re initially excited and do all the prep work from an initial exam which reveals something strange going on and the strangeness comes to their home, albeit it doesn’t come to a head until towards the end. Oh, and we also get some “creepy” scenes that for me were unintentionally hilarious, involving a priest having a stroke and getting a massive nosebleed as a possessed (red-eyed) Sam glares at him as well as a freaky incident in a grocery store parking lot. Meanwhile, there are others who have taken special interest in Sam’s pregnancy installing a multitude of hidden cameras in their home to keep tabs on them. Well, that’s it. It’s a simple story where despite only an 89-minute running time, there’s really only 20-minutes of actual good storytelling to be told culminating with some cool special and visual effects which even I have to admit were cool looking, and probably the main reasons Matt Bettinelli-Olpin and Tyler Gillett were hired on based upon their vignette in VHS2. Another positive aspect, weak as it is since the story is mostly dull, but I will give some credit to the film’s two leads: Zach Gilford (“Friday Night Lights”) and Allison Miller (“Go On”) who at least are believable as a loving couple and they share some good chemistry with one another throughout, it’s just a shame the script couldn’t help them out… I can’t imagine how awful this movie would’ve been if they didn’t have chemistry. All in all, Devil’s Due joins the long line of the crap found footage flicks to grace the home video market and/or theaters over the years. While not quite the worst I’ve had to endure especially considering a great finale sequence, but it’s still not great. What should’ve been a short film instead turned into something that dragged on for too long. This release comes with a semi-glossy and semi-reflective slip cover. Inside is an authorization code for the Digital Copy. Audio Commentary – Filmmakers and friends Matt Bettinelli-Olpin, Tyler Gillett (directors) and Chad Villella and Justin Martinez (executive producers) keep it light-hearted and given they’ve known each other for years provide some fun tid-bits and provide some behind-the-scenes info on the process of making the movie. Deleted Scenes (16:35; HD) includes nine scenes either cut or trimmed including an alternate ending. Most of these are pretty pointless and would’ve only served to bog down the movie even more. Radio Silence: A Hell of a Team (12:18; HD) is collected interviews with four members of the crew (directors and producers) nicknamed “Radio Silence” as they chat about the movie and their history together. Directors Photo Album is merely a collection of still images. Finally there are the two prank videos from Radio Silence: Roommate Alien Pranks Goes Bad (2:19; SD) and Mountain Devil Prank Fails Horribly (3:26; SD). Like with most of the found footage movies, this is to make it look like it was filmed by amateurs with shaky camera work, drab colors and not great detail levels. It’s an OK transfer, though, suitable for a movie like this. Stunningly, the provided 5.1 DTS-HD Master Audio is not only strong but quite robust showing off each bit of sound in every nook and cranny plus some amazing depth with the LFE channel working overdrive to provide pulses through the entire room. Overall, Devil’s Due might not be the worst found footage movie I’ve encountered in the last few years but it sure as hell (no pun intended) is the dullest with the first 50-minutes of either boredom as we watch somebody else’s home movie or laugh out loud at some unintentional funny moments, but the final sequence isn’t bad and is actually fairly impressive, yet it can’t quite make up for the rest of the film. The Blu-ray at least has an OK selection of bonus features while the audio/video transfers are more than adequate.